So far in this series it’s been deer, ducks, swans etc. – nothing particularly exotic. Finally we came across something rather special: Southern White Rhinoceroses. White rhinos are the second largest land mammal and their name comes from the Afrikaan’s, a West Germanic language, word “weit” which means wide and refers to the animal’s mouth. Also known as the square-lipped rhinoceros, white rhinos have a square upper lip with almost no hair. 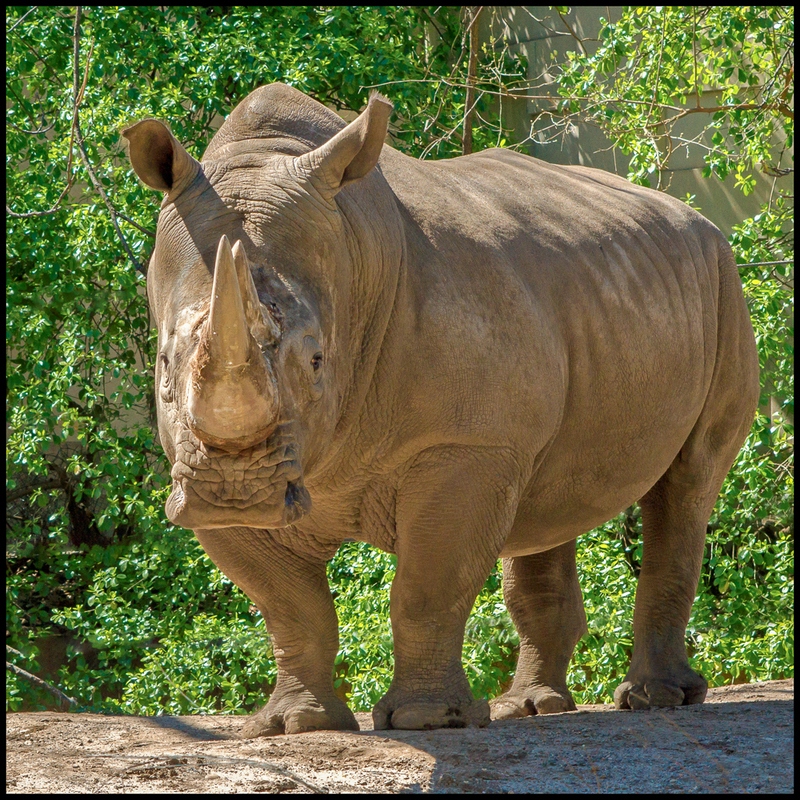 Two genetically different subspecies exist, the nothnern and southern white rhino and are found in two different regions in Africa. As of March 2018, there are only two rhinos of the northern white rhino left, both of which are female. They live in the Ol Pejeta Conservancy in Kenya and are protected round-the-clock by armed guards. Their near extinction is due to decades of rampant poaching for rhino horn. The majority (98.8%) of the southern white rhinos occur in just four countries: South Africa, Namibia, Zimbabwe, and Kenya. Southern white rhinos were thought to be extinct in the late 19th century, but in 1895 a small population of less than 100 individuals was discovered in Kwazulu-Natal, South Africa. After more than a century of protection and management, they are now classified as Near Threatened and 19,600 – 21,000 animals exist in protected areas and private game reserves. They are the only of the five rhino species that are not endangered. White rhinos have complex social structures. Groups of sometimes 14 rhinos may form, notably females with calves. Adult males defend territories of roughly one square mile, which they mark with vigorously scraped dung piles. The home range for adult females can be more than seven times larger, depending on habitat quality and population density. Breeding females are prevented from leaving a dominant male’s territory, which is marked and patrolled by its owner on a regular basis. Males competing for a female may engage in serious conflict, using their horns and massive size to inflict wounds. There were actually two of them in the enclosure, but I liked the way this one was looking directly at me. I was also feeling glad there were barriers between it and me. Taken with a Sony Alpha 500 and Minolta 100-200mm f4.5 AF. 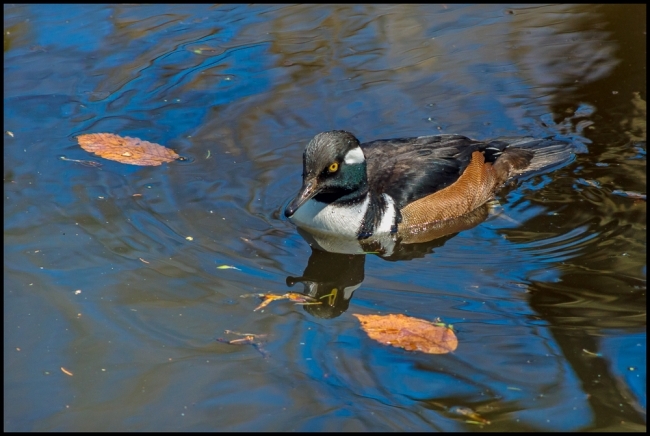 At first I thought this was a mallard, but on further consideration I’m not at all sure that it is. I seems smaller and with a a more “pointy” bill than the mallards I’m familiar with. The coloration also seems different. After browsing through a lot of images I’m unable to discover what it is at this point. I’ll keep trying. Don’t you think it looks a little annoyed? 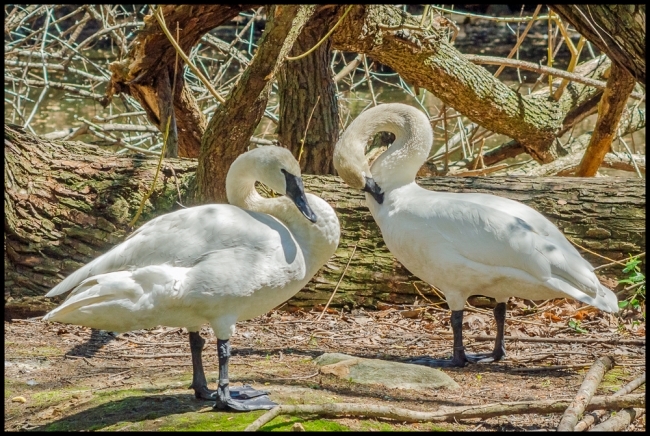 These two swans formed part of the Northern Ponds exhibit. I believe they are Trumpeter Swans. I’ve always loved swans. They’re so elegant. They’re also quite large and rather mean. I once saw a swan clear a pond of a bunch of Canada Geese that had dared to land in its territory. I always thought of Canada Geese as large birds until I saw one next to an angry swan. I also once had the misfortune to be in a canoe that capsized, dumping me (and the other occupants of the canoe) into the water right next a nesting swan. I wasn’t afraid of the water, but the angry swan was extremely scary. However, I still love swans – at a distance. Taken with a Sony Alpha 500 and Minolta 100-200mm f.5 AF. Compared to the more exotic animals (e.g. lions, tigers, rhinos etc.) a bunch of deer wouldn’t seem to be anything special. After all we have large numbers of them wandering all over our property. Apparently the deer went extinct in its native land (China), but survived because a few specimens has been sent to the Duke of Bedford‘s deer park at Woburn Abbey in the UK. One of the first exhibits we came across was the Bison Range. 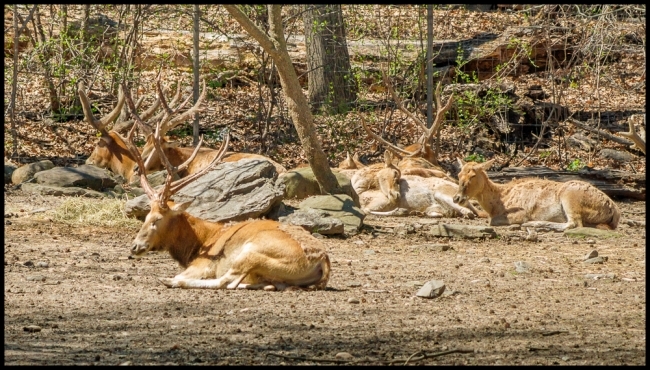 The Bison Range is in the northeast corner of the zoo, and has been a feature of the zoo since its opening. The range initially served to breed Plains bison, who were in danger of becoming extinct in the United States. Today, the exhibit continues to hold one of the few large herds of bison in U.S. zoos. In 1913, at the behest of the American Bison Society, fourteen bison were transported from the range to Montana’s National Bison Range, as well as to Wind Cave National Park in South Dakota. In 1905, the zoo’s first director, William T. Hornaday, along with President Theodore Roosevelt and other conservationalists, created the American Bison Society (ABS) in an attempt to save the American bison from extinction. The bison had been depleted from tens-of-millions of animals to only a few hundred by the end of the 19th century due to westward expansion. The society worked to breed the species in captivity as well as raise public awareness, raise money to create protected reserves, and reintroduce bison back into the wild. On October 11, 1907, the first reintroduction of bison began when the zoo sent six males and nine females, by rail, to the Wichita Mountains Wildlife Refuge in Oklahoma. Seven days later, the animals were successfully reintroduced to the park. By 1935, the society, who had successfully carried out several more reintroductions from bison kept in zoos and ranches, considered their work done and disbanded that year. In 2005, the Wildlife Conservation Society resurrected and re-purposed the ABS to, “help build the social and scientific foundations for the ecological restoration of bison,” and, “restore bison ecologically, not just animals in pens but actual functioning animals in the larger landscape,” (Keith Aune, WCS bison coordinator). According to a study published in 2012, virtually all wild and captive bison in the United States are hybrids with cattle genes, with the exception of the two distinct breeding populations within Yellowstone National Park and their descendants. The cattle genes entered the bison population due to private ranchers hybridizing their bison to make them more docile, with some of these animals being accidentally reintroduced by the ABS. In response, in the fall of 2011, the WCS arranged for a herd of female bison originating from the American Prairie Reserve to be sent to the Colorado State University’s Animal Reproduction & Biotechnology Laboratory to be used as surrogates in an attempt to transfer the fertilized embryos of genetically pure bison. 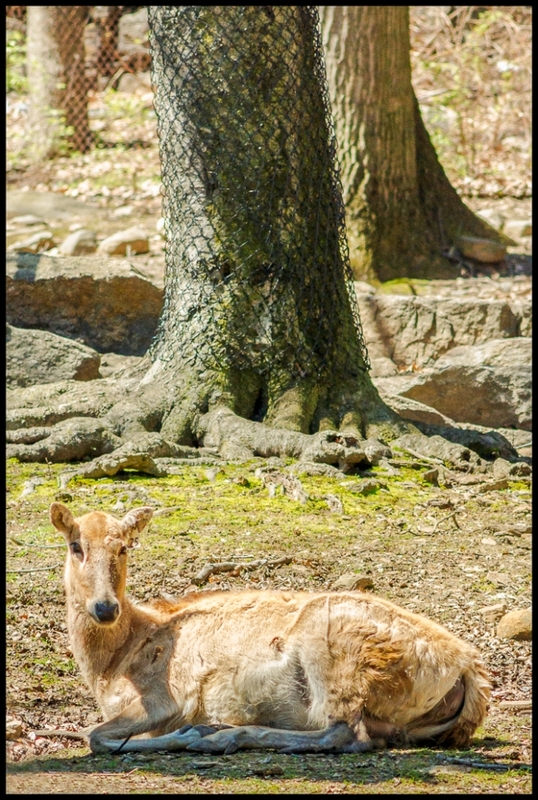 After an ultrasound showed one female to be pregnant, the herd was moved to the zoo where, on June 20, 2012, the calf was born. 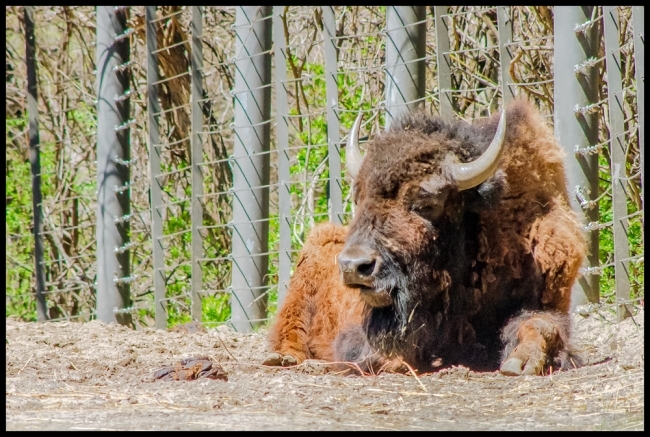 The herd is kept in an off-exhibit section of the zoo and the goal is to eventually create a breeding herd of genetically pure bison through embryo transfers with the surrogate hybrid bison.